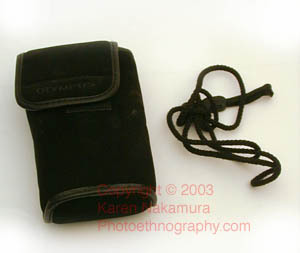 The Olympus C-900 is a 1.3 megapixel digital camera. 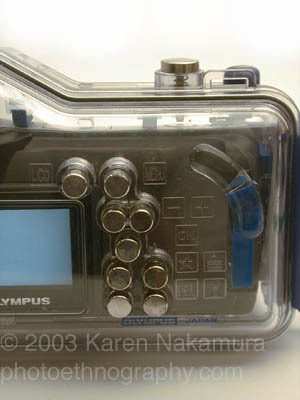 It's nothing special by itself except that it comes with a fantastic Olympus-original underwater plexiglass case. 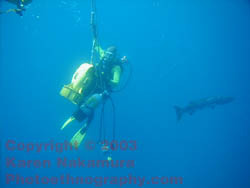 I took this unit diving in North Carolina to 130 feet without problems. 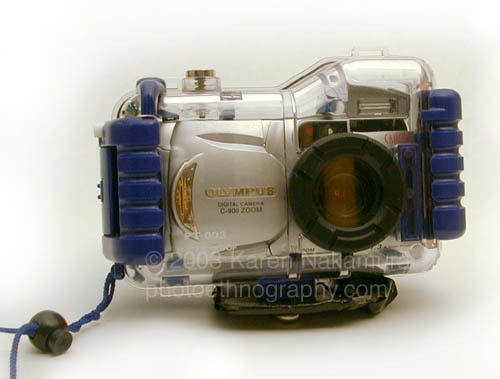 The nice thing about the case is that it is designed so that you can use the flash underwater. This is essential as sea water filters out most of the red spectrum, rendering that nice coral or tropical fish very flat. The flash returns that. And you can use a slave strobe with it as well. Now that I'm in land-locked Minnesota, I don't scuba dive as often as I'd like and I decided that I should sell this to someone who will actually use it more than once a year. 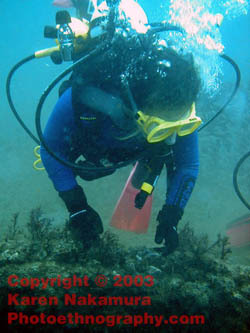 The camera has been used on about 20 dives in North Carolina, Australia, and Japan. It's gone to 130+ feet without a problem. 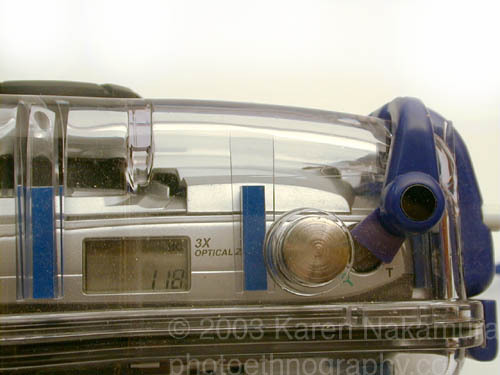 The camera comes with the case, the silicon sealant, and an 8mb memory card. I ended up selling it on ebay in the summer of 2003. The camera is self-explanatory so I don't think the missing manual should be a problem. I can walk you through it. 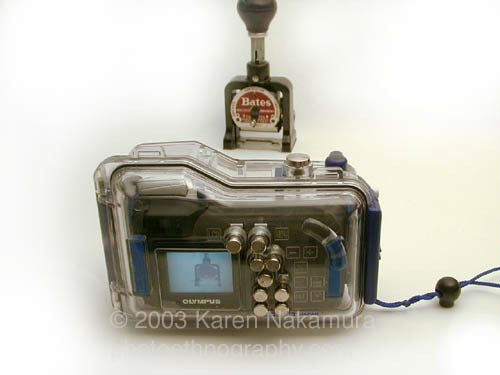 What is nice about the case is that you can access all of the camera's controls even underwater. 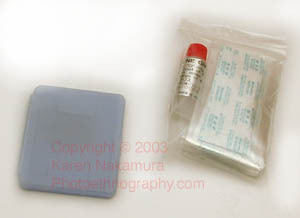 The buttons are well-sealed and can be used with even thick deep diving gloves. 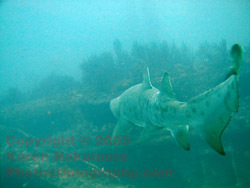 I dive decompression and nitrox, it's nice to be able to play with the camera while you're at a decompression stop. I'm including this small lead weight with my name handily magic markered on it. Why is it important? This carefully calibrated weight makes the unit neutrally buoyant in sea water. The nice thing about the case is that it has a tripod/accessory mount on the bottom. 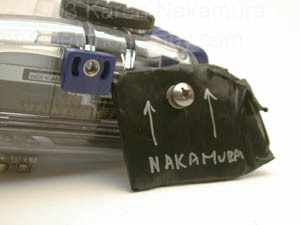 If you use a slave strobe, this is where you'd mount it. 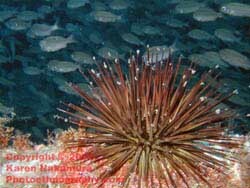 A few years ago, I went on a deep sea diving trip off Moor's Head, North Carolina. We were diving boat wrecks. The depth was about 120-140 feet. 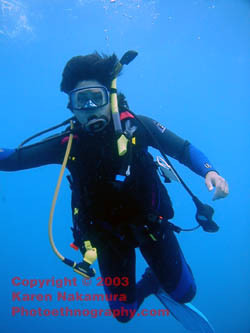 I was diving Nitrox, most other people were using mixed gasses. Decompression stops were mandatory. All of the photos here are from that trip. That's me in the top left photo, hanging on the decompression line. Right below it, you can see the barracudas that joined us while we were decompressing. To the right of that is one of the sharks near the wreck that I was following around (he got annoyed after a while, so I left him be). The anemone in the bottom was taken using flash to bring out the colors. And the bottom right photo gives a sense of the camera on dry land. Colors were "auto-levelled" in Photoshop and watermarked, but otherwise no other adjustments (sharpness, etc.) were made. Click on any photo to enlarge it to full size. 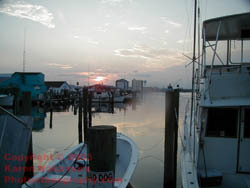 Last modified: Thursday, 11-Mar-2010 00:59:01 EST , [an error occurred while processing this directive] .